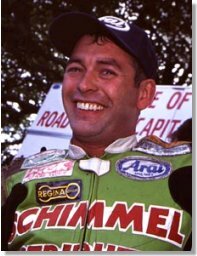 Geoff McMullan was sensationally disqualified from the 2000 TT Lightweight 400cc Race, after being declared the winner, for using an oversized motor. We spoke to the McMullan from Banbridge in Northern Ireland about the race itself, the time since the race and his plans for the future. Geoff, there has been a lot said and written about THAT race, but you have never really had your say. Go ahead and tell me your side of the story. Well first of all, the important thing to know is that it wasn't the same bike I rode at the TT in '99. This bike was a 400, which had been bored out with 600 pistons, but with a standard head, so where it was gaining in one sense it was losing in another, whereas my 400 from the year before was a fully tuned, legal 400. The press tried to make out I took a 600 bike out into the race, which was a load of nonsense. My fastest lap last year was 106mph throughout the fortnight, whereas the year before I lapped at 108mph, close enough to 109mph actually on my own bike. I finished third in that race and the bike was checked. I can understand why people find my story hard to believe because of the way the story was put out by the media. So why were you not riding your own bike? Towards the end of 99, at the Leitrim Road Races, I blew my own bike up so I used an engine from a friend in England for the remainder of the season. 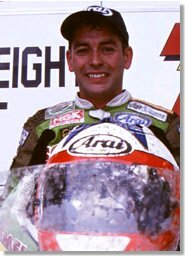 It was going to cost £2000 to £3000 to fix my engine, and because the only race I was going to do in 2000 on a 400 was the TT, It would have been hard to justify the money. I got the offer to borrow a machine for the TT, which of course I did, and the people who say it was the same machine as the year before are wrong. It wasn't. What was the public reaction like towards you after the race? Well there were a lot of people starting rumours and writing stuff about me, but I don't think any of them stopped for one minute to ask me my side of the story or worry about how it would affect me. I had to ring Manx Radio, the BBC myself and the local newspapers back home to give my side of the story, and when I explained to them they understood. I still have the odd person now that'll say things behind my back, but I know who my friends are. The majority of people in the paddock who know me don't think I am a liar and a cheat. I mean if anyone thinks I'm that stupid to go and win the thing with a big engine in it, if I had of known. I could have led and then broke down on Hilbary on the last lap and come home a hero, because I knew it was going to be checked. So you are planning to comeback to the TT next year. That must have been a difficult decision to make? Well when I go back to the Isle of Man, I just don't know what kind of reception I'm going to get, but whatever it is, I'm just going to have to deal with it. But, I'm looking forward to going back and I love the TT course. I'm hoping to do the Formula 1 for the first time and the Junior, plus the 400 race of course. And what machinery have you lined up for next year? Well, I have a few irons in the fire for the big bike, so I'll just have to wait and see what happens. For the 400 race, which I'm going back to try and win, but I realise there are higher profile riders in the race compared to previous years. If I can lap faster than I did this year on a 400 I think I will have proved. The machine will be another 400 Yamaha and I will be riding it for Crossan Motor Cycle's Racing Team. And where else other than the TT do you intend to ride? I'll be doing all the roads at home, the TT and other rides in England, and I might try and get to Mettet or something. Is there anyone you would like to thank for their support over the last year? Trevor Diffen and Gregory Croft who did a brilliant job for me at the TT last year even though what happened happened and I'm really glad the two boys are helping me again this year. I would also like to thank anyone else that supported me over the last eight months. Thanks for taking the time to speak to me, and best of luck for the future.